UB Naked Guy standing with True Blue at a game. He has become a common fixture at UB games often sitting with True Blue. 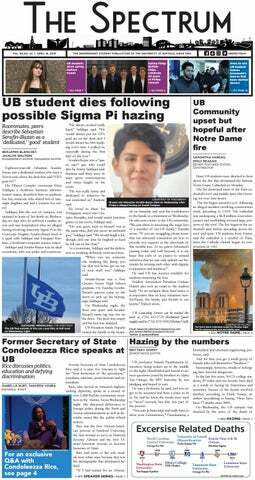 Starting this year, Yagielski, a junior digital media production and tuba performance double major, has attended dozens of Bulls sporting events as UB Naked Guy, a mascot for student sports at UB. Yagielski’s look of cowboy boots, cowboy hat and short-shorts with a bare chest and legs has become one of the most consistent sights at Bulls games over the past five months. He even brings a sign with him so he can be easier to spot. Besides Victor E. Bull, UB Naked Guy is one of the most well-known figures in UB sports. For Yagielski, a member of True Blue, it is something that went from dare to full-time gimmick. When Yagielski hit the field he ripped off the loose tank top he was wearing and Naked Guy made his debut. He said after the game his friends went up to him and told him they never expected him to do it. He said he was already wearing short-shorts and cowboy boots to the games so it wasn’t far off from what Naked Guy looks like now. Almost immediately after the run on the field, people were going up to Yagielski and asking for a picture, something that has become a norm for him. McCormick helps by writing on Yagielski’s chest. McCormick remembers when Yagielski told him in November he wanted to do something new with Naked Guy, but not knowing what. During a cold November night during a football game against Bowling Green, McCormick found out the change. The traditional short shorts were swapped for a speedo. Yagielski said he spent the entire “below freezing” night in the outfit, keeping himself warm by going into the bathroom to be near a heater and to throw hot water on himself. McCormick described it as Yagielski “upgrading” the Naked Guy outfit. To Yagielski, college sports antics like Naked Guy are a normal part of college athletics. Yagielski has followed Division-I sports during his entire tenure at UB, once being a part of the Thunder of the East band. Yagielski said he looks at big conference school student sections and sees an environment that could exist at UB given the school’s size. He said students section antics like Arizona State University’s Curtain of Distraction are the kind of things that inspired him to make the Naked Guy a regular fixture at Bulls sporting events. His routine at basketball games can involve calling out coaches for having their shoes untied, counting down from 20 when there is only five seconds left on the shot clock, yelling “bad” at the first sight of an airball and more hijinks. He admits interest in UB sports could be better, but is happy to see as Naked Guy grows, so does interest in the Bulls. He cited the recent men’s basketball game against Western Michigan crowd of more than 7,000 as a sign school interest is growing. Yagielski said he slowly gains Twitter followers for the @UBNakedGuy account after every game. The account’s cover photo is a picture of Yagielski as UB Naked Guy holding a sign that reads, “Khalil Mack is my dad.” Recently men’s basketball head coach Nate Oats started following UB Naked Guy. Freshman biological science major Ashley Comstock and Yagielski have only been dating for a couple of months, but Comstock can remember briefly meeting him in September. Comstock said by just getting to know Yagielski, nothing he does as UB Naked Guy surprises her. She said he has a large comfort zone even in the most awkward of situations. Even her parents found out about her new boyfriend through UB Naked Guy. Now Comstock finds herself helping Yagielski get the black marker off his chest, just so he can do it again days later. Yagielski considers UB Naked Guy a character to have fun with at games who stands on his own opinion, separate from True Blue and even Yagielski himself. Perhaps left most unphased by the character is his own mother, Pam Yagielski. Yagielski said his parents support him in almost all of his antics, Naked Guy included. He said his parents don’t have a problem with it even as he adopts things like a speedo. “I think [my mom] just wishes I wouldn’t swear so much,” Yagielski said. The future for Naked Guy is something Yagielski is always thinking about. He said it is a question of “how do I keep this fresh?” For him, that is considering things like writing something new on his chest or a new sign. Yagielski said he is not sure what the future for Naked Guy will be, but plans to do it as long as possible. You can see UB Naked Guy at most major Bulls home games.